Do you love backpacking downhill, along a river, crossing the river often, swimming and good food at night? 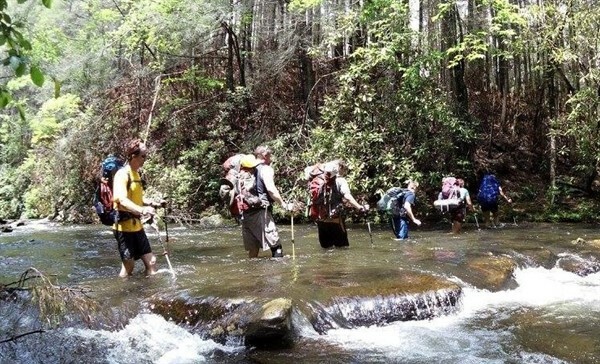 Come join us down a trip leader’s favorite trail in the Southeast. We will be hiking mostly downhill as we follow Jack’s River, crossing the river approximately 42 times over 16 miles. This is a 3 day trip, the first day will be a leisurely hike as far as the group feels they would like to go; there is about a 3.5 hour drive in the morning followed by about an hour and a half shuttle provided by a third party company. 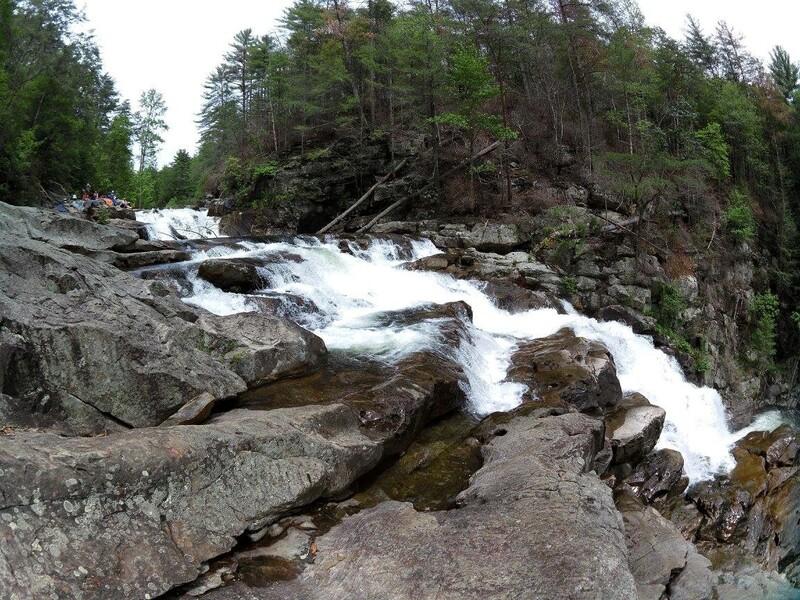 The Second day we will hike to Jack’s River Falls where we will stop to play in the river and have lunch before hiking on downstream setting up a nice 3-5 mile hike out on the third day. This trip is a favorite of many Team Lightning participants! Dress in clothes that dry relatively quickly, as well as wear shoes that are river crossing worthy! We will be crossing the river so often that we will not want to stop to allow you to take off your leather boots for every crossing, nor do you want leather boots or heavy boots to be saturated with water… it is not very comfortable. Beginners are encouraged to come, but please do not attempt this hike unless you are in pretty good condition, as it is fairly strenuous due to the river crossings. It is highly recommended to use trekking poles for the river crossing and pack your sleeping bag/clothes in a form of dry sack. Difficulty: This is considered a fairly strenuous trail due to the river crossings (water levels vary) and some strenuous parts, so hiking poles are recommended. Hikers in good physical condition with experience hiking at least 5 miles or more on wooded trail are welcome. Registration Deadline: The deadline to register for this trip is Wednesday, May 22nd at 3pm. Group Size Limit: This trip is limited to 8 participants. Dog Policy: Friendly dogs that have experience hiking over 8 miles and that have camped overnight with strangers are permitted on this trip. Weather Policy: This trip is drizzle or shine. This trip may be cancelled in the event of severe weather. Participants will be contacted by their trip leader during the week leading up to the trip with additional weather information. Cancellation Policy: There are no refunds for this event. Should you register and need to cancel, please email TeamLightning@Lightning100.com. Hike Elevation Gain: Approximately 1500 ft. The plan is to meet at Sams Club at 6:00am CST and expect to arrive at the ending trailhead (Jack’s River Western Trailhead) around 11AM (EST). Plan to meet with our Shuttle Company at the trailhead at 11AM (EST) and take the shuttle around to the beginning trailhead (Dally’s Gap). You will need to supply your own breakfast (2 days), lunch (2 days), dinner (2 days), and snacks, water is plentiful along the trail. Participants are also encouraged to bring extra socks and shoes to be worn in camp. Group lunch on the way back to Nashville is optional. There are NO restrooms at the trailhead… so we will be stopping at a gas station in route! Team Lightning practices Leave No Trace guidelines. Follow this link to see what you can do to keep our trails clean and safe. Please check out the Backpacking Checklist available on the Resources Page. Registration is required. If you sign up and need to cancel, please email TeamLightning@Lightning100.com.